In her best-selling book Eat, Pray, Love, Elizabeth Gilbert says, “Unless you were born one of those rare shimmering saints who come into life already fully actualized, you’re going to need some guidance along your journey toward enlightenment.” (123, Gilbert) Mariana Caplan has made it her mission in her new book, The Guru Question: The Perils and Rewards of Choosing a Spiritual Teacher, to enlighten you on finding the guide you need for that journey. Most people have an idea of what defines a guru. If pressed, they might think of a guru as a teacher (specifically a spiritual teacher) or a guide to spiritual teachings. But Caplan demonstrates early on in her book that many can fit the description of guru, from the Dalai Lama to your therapist. There are different levels of guru, as there are different levels of devotion to gurus from their students or disciples, another term that bears explanation, and Caplan handles that as well. Ultimately, The Guru Question provides the reader with the required decision-making tools to determine if one’s spiritual needs can be met or not by pursuing the guru path as a student, or, perhaps, as a guru, since some students progress to guruhood themselves. When reading the book and contemplating my own situation, I frequently found my eyes opened, as I realized that she was making me think about things that had not occurred to me before – an invaluable ability in one who guides others through the tricky and often pitfall-riddled quest to become a student. The question of whether or not one needs, or is ready for, a guru is the question around which the book focuses. Caplan holds up the magnifying glass to an assortment of gurus, citing the bad along with the good. Her own quest to devote herself to a guru started off on what could be called a non-beneficial path, but became, instead, an experience of learning and growth. She takes that false start and allows us to learn from it vicariously. If you have already started your search for a guru, and especially if you have been disappointed during that search, Caplan’s insights will help you to get over those disappointments, and continue searching with new abilities in discernment – if you still decide that you want to keep looking. Caplan explains clearly what a student requires of a guru, but she also explains clearly what gurus require of students. The straight-goods discussion of the reality of the relationship will either change your mind and end your quest, with the acceptance that you are not prepared to take on that responsibility, or solidify your resolve to find the right teacher, worthy of your trust and devotion. What Makes a Trustworthy Guru? While we can all agree that no one is perfect, it’s an expectation we can have of gurus, even as we deny that we have it. When gurus turn out to be only human after all, disappointment can spoil what would otherwise be a beneficial relationship. Caplan provides us with perspective on what makes a guru trustworthy, and how to spot the divine spark and source of power in a true guru. Caplan understands psychology and incorporates psychological explanations behind the guru-student relationship in her examination of the dynamics that can result in scandals. Hitler and Jim Jones are extreme examples of scandalous leaders, and she references their atrocities but does not dwell on them. She instead explains the variety of psychological difficulties that can arise when one walks the spiritual path in close relationships with others. While her focus is the student and guru relationship, much of her advice can be extrapolated to any close relationship, in particular, any relationship where one person holds power or authority over another. While most think of the person with the authority as the one accountable for the scandal, Caplan reminds us that there is “mutual complicity” between student and teacher in such circumstances. She deals with the subject of “scandalous students” as well as she talks about scandalous teachers. She includes an entire chapter on false complaints made by students against teachers as an epilogue, citing the case of her partner, Marc Gafini, as an example of the damage that can be done by false accusations. It is not only gurus that must be trustworthy. Caplan’s book comprehensively discusses and answers the main guru question she poses in the title of the book. She enhances the book as a reference on the subject with interviews with a variety of gurus in an appendix and includes a bibliography that makes a great reading list. The interviews are profound and meaningful and become more so when you find out that two of the gurus interviewed have passed since she wrote the book, as did Caplan’s teacher Lee Lozowick. The interviews provide snippets of wisdom that, in a few words, paragraphs, or pages make you pause and take stock. Every time I picked up the book and flipped to an interview, I found something synchronistic that applied to my situation at the time. No doubt Caplan’s intent for her book was not that it be used for bibliomancy, but it does work well for that. It provided a new perspective for me on my situation and allowed me to work through it, if not more easily, then with more enthusiasm and hope. Mariana Caplan, PhD is an award-winning author, a psychotherapist, and a professor of yogic and transpersonal psychologies. She co-founded the Center for World Spirituality and has written seven books on the subjects of psychology and spirituality. Her most acclaimed book, Eyes Wide Open: Cultivating Discernment on the Spiritual Path won five awards for best spiritual book of 2010. Caplan knows her subjects intimately, having walked the spiritual path and searched successfully for a guru herself. She has spent over twenty years living and breathing her work. She has two websites: Real Spirituality and Center for World Spirituality. While this book is a comprehensive guide to everything you wanted to know about choosing a spiritual teacher but didn’t even know you needed to ask, adding a section of interviews with students as well as the gurus would have made it more complete. However, Caplan’s candour, experience, and ability to focus on the relevant issues related to gurus, and the problems associated with seeking and finding them, make this book a useful addition to any reference shelf. Caplan, Mariana, PhD. 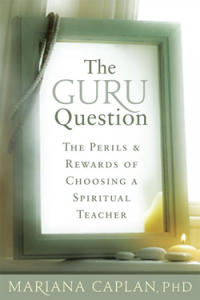 The Guru Question: The Perils and Rewards of Choosing a Spiritual Teacher. Boulder: Sounds True, 2011. Gilbert, Elizabeth. Eat, Pray, Love: One Woman’s Search for Everything Across Italy, India and Indonesia. New York: Penguin Group, 2006.
iEvolve: Center for World Spirituality (Accessed June 29, 2011). Real Spirituality (Accessed June 29, 2011). Press Kit from Sounds True (Accessed June 29, 2011).